Even if you are well aware of how important a strong social media strategy is to your online marketing campaigns, it may not always feel like the quality of your results are matching your efforts. This can make the hours you spend each week on social media marketing even more difficult to justify—especially to higher-ups in your company who may not be as confident in the value of a strong social media presence. Luckily, there’s a way to improve your B2B social media strategy and get the type of measureable results you want. It’s just a matter of going to the data. Before you make any drastic changes, first take the time to evaluate your current strategy. Consider how many platforms you’re using—are you able to maintain active and updated profiles on each channel? If not, it may make sense to pare down your presence to just the few platforms where you’re seeing the best results. In order to determine which social media channels you should focus on, look first to your website’s Google Analytics data and see where you’re receiving the most referral traffic. This will tell you which of your social media channels are working to drive traffic to your website and create new leads. On the other hand, if you’re new to social media marketing and don’t yet have a well-developed strategy, you may be wondering where to start. For professional services firms, we recommend starting small by building a strong presence on LinkedIn and Twitter. Though it varies based on the platform, most social media channels have some sort of dashboard that records activity and other metrics that can be a great starting point for analyzing your progress. By keeping track of this easily available data, you can see your growth by month and determine where you need to make changes to get more out of your profile. As an example, try tracking which types of posts and content tend to get the biggest response from your followers. And analyze posting times and frequency to see what suits the needs of your audience the best. 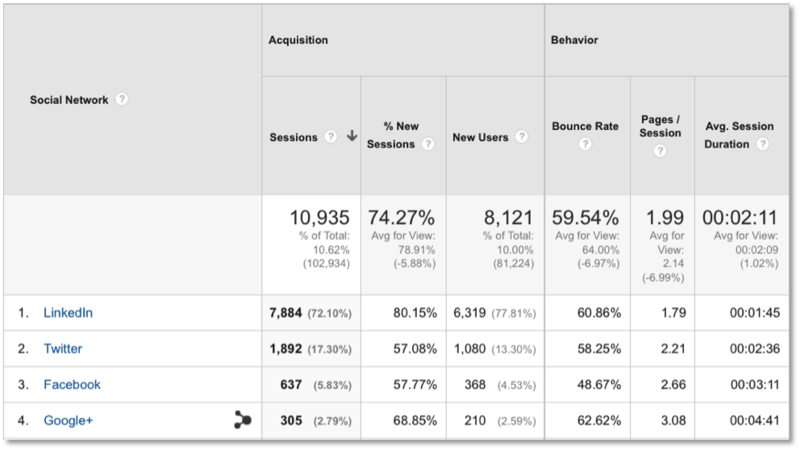 Though some many find it intimidating, Google Analytics (or similar analytics tools) can provide a wealth of information to improve your social media strategy. In the case of this sample firm, LinkedIn and Twitter are clearly the most beneficial, with LinkedIn as the standout. Many professional services firms are creating employee advocacy programs to encourage employees to promote firm content on their personal social media pages and help build the firm’s overall brand. Employees also have the advantage of being the firms “ears on the ground”—they can listen to what’s being said about the firm and find opportunities to join in the conversation. When your employees become brand advocates, it offers your firm a unique opportunity to expand your reach and visibility through your employees’ network. Not only does employee advocacy help share your firm’s voice, but it can also humanize your brand. As your employees expand their own influence and visibility, they can also work toward becoming Visible Experts℠. Building a recognizable personal brand can have significant benefits for both the individual and the firm as a whole. With these tools, your firm can begin quantitatively tracking your social media efforts. The data provided can then be used to make informed decisions about your marketing tactics so your firm can make the most of your social media channels.